A joint IUPAC/IUPAP Working Party (JWP) has confirmed the discovery of the elements with atomic numbers 114 and 116. In accord with IUPAC procedures, the discoverers proposed names as follows: flerovium and symbol, Fl, for the element with Z = 114 and livermorium with the symbol Lv for the element with Z = 116. The Inorganic Chemistry Division recommended these proposals for acceptance. Comments should be submitted by 30 April 2012. The text of the Provisional Recommendation can be downloaded from http://media.iupac.org/reports/provisional/abstract11/corish_300412.html. Comments should be sent to Prof. John Corish at jcorish@tcd.ie. Extract from the new 8th Edition (2012) of the Karlsruhe Nuclide Chart showing the isotopes of flerovium and livermorium. A recent Nature editorial discusses the health effects of low-dose radiation in Europe. The Federal Office for Radiation Protection in Germany (BfS) has been instrumental in setting up the Multidisciplinary European Low Dose Initiative (MELODI) which is a platform of 15 European agencies and Institutes to coordinate activities in this area. MELODI also proposed a 6-year EC Network of Excellence called Low Dose Research Towards Multidisciplinary Integration (DoReMe). However in the Nature editorial, the general tone of the article is very much that low does of radiation are harmful. There is no mention of radiation hormesis – which suggests that low doses of radiation may have a beneficial effect to biological systems. The first observation of hormesis dates to the 1940s where it was reported that low doses of Oak bark extract stimulated fungi growth. In the 1980s, the first complete report of radiation hormesis was published (Luckey, 1991). It has been claimed (Calabrese, 2003) that toxicological models in current use by regulatory authorities are incorrect. Traditionally, the dose-response relationship used for risk assessment is the so-called “linear non-threshold model” (LNT) (see figure). 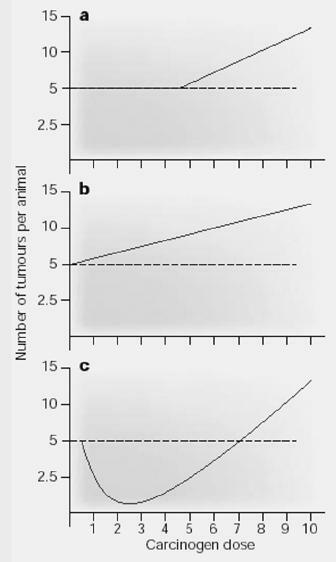 Hypothetical curves depicting a) threshold, b) linear non-threshold, c) hormesis dose response models. It is hoped MELODI and DoReMi shed more light on the toxic effects of low level radiation in particular which dose-response relationship is applicable in which situation etc. Science, policy makers and the public will benefit from a reduction in uncertainties in the health risks of low dose radiation. T. D. Luckey, Radiation Hormesis, CRC Press, Boca Raton, 1991. E. J. Calabrese, L.A. Baldwin: Nature 421, 691 (2003) see Toxicology rethinks its central belief. This conference is a traditional annual meeting for nuclear professionals, decision makers, opinion leaders from nuclear utilities, potential investors, regulatory bodies, nuclear research and education institutions from Europe and abroad to meet and discuss scientific, research, professional, industry-related and general social aspects of future use of nuclear energy as a sustainable source in the broader international arena. More than one year on from Fukushima-Daiichi accident, analyses continues and public debate often looks back at important events in the past. Sustainable use of nuclear energy offers many environmental and energy supply advantages, but lots of arguments are thrown into the discussion and mixed up. With this in ind the conference aims at clarifying the role of nuclear energy in providing environmentally, economically and socially sustainable energy future for all. It will focus on providing high-quality, relevant and reliable information for clearing the view into the sustainable energy use in the future. For this reason prominent invited speakers on the conference from WANO, IAEA and NEA will highlight some of the most important issues. What are the difference between the various databases used in Nucleonica? The main nuclear data database is the Nucleonica database. This is based mainly on the JEFF3.1 evaluated nuclear datafile but with some corrections and improvements. The Joint Evaluated Fission and Fusion File (JEFF) project is a collaboration between NEA Data Bank member countries to produce a common set of evaluated nuclear data, mainly for fission and fusion applications. This database provides the full set of radioactive data required for many of the applications in Nucleonica such as Dosimetry and Shielding (for example, the nuclide Pu239 has over 200 gamma energies and emission probabilities). In the Nuclide Datasheets in Nucleonica, users also have access to the 8th Table of Isotopes (1996). Access to this database is for comparison purposes only (e.g. to compare gamma energies etc. from the JEFF3.1 and the 8th TOI). The 8th TOI is edited by Richard B. Firestone and Virginia S. Shirley from the Lawrence Berkeley Laboratory. In particular cases additional data sources are used. For the cross sections in the Nuclide Datasheets, for example, data from the JEF Report 14 “Table of Simple Integral Neutron Cross Section Data from JEF-2-2″ have been used. There the user can chose between a variety of datafiles JEF-2-2 (European), ENDF/B-VI (US), JENDL-3.2 (Japan), BROND-2 (Russia), and CENDL-2 (China). The data include the averaged cross sections (2200 m/s, Maxwell average, resonance integral, 14 MeV, and fission spectrum average) for a range of important nuclear reactions including (n,gamma; n,fission; n,2n; n,3n; elastic; inelastic and total) and from a variety of databases. Results for Cl-35 are shown below. Point-wise (shown on the right), average (multi-group), and (x,xn) cross sections as a function of energy are shown in graphical form (where available). There is also the Karlsruhe Nuclide Chart database. This is used for updating the various paper based nuclide charts with the most recent nuclear data. It is currently only available to the Nucleonica Team for data management in the nuclide chart.